WhatsApp is a top-rated messaging app for Android, iOS and Blackberry smartphones. Approximately 300 million iPhone consumers use WhatsApp for messaging and chatting. With the latest version, you can use WhatsApp to send and receive text messages, photos, voicemails and even video clips. Voice call is also available for now. This is a big plus over other apps. When using the app, it may be necessary to delete some messages to free some space. In doing so, there may be times that you may accidentally delete important messages. Here are some easy ways to recover deleted WhatsApp messages on iPhone with or without backup. According to WhatsApp's official website, they don't store personal data on their server. It includes messages, chat history and attachments sent and received by WhatsApp users. They can't recover deleted WhatsApp messages on iPhone for any user. However, you can restore them easily if you have previously made a backup of WhatsApp chat history on iCloud. Step 1: Verify that you have made a backup on iCloud by going to WhatsApp > Settings > Chats > Chats Backup. Proceed if you have a backup saved on your iCloud account. You can make a backup by going to WhatsApp > Settings > Chats Backup > Backup Now. You can also choose the option of enabling scheduled backup. It will back up your chat history regularly. Step 2: Uninstall WhatsApp and reinstall it from the App Store. Step 3: Verify the phone number and follow the prompts to restore your messages and chat history. Step 4: All your backup messages and chat history on WhatsApp should now be restored. Note that you must use the same phone number that you used to back up data to successfully recover deleted messages on iPhone. You can't restore messages and chat history from a different WhatsApp account. However, if you didn't have a local backup on iCloud, then you should follow the instructions in Part 2 to retrieve deleted messages from WhatsApp. Another quick and easy solution to recover deleted WhatsApp messages on iPhone is to use a third-party program like iPhone Data Recovery. 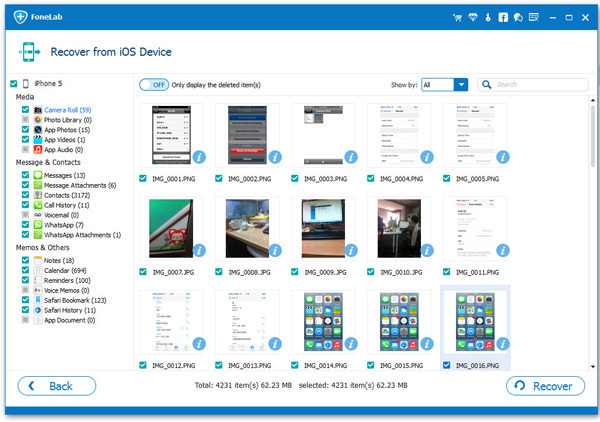 This type of recovery tool is able to retrieve deleted or missing data from iOS device, including messages, photos, attachments, contacts and so on. 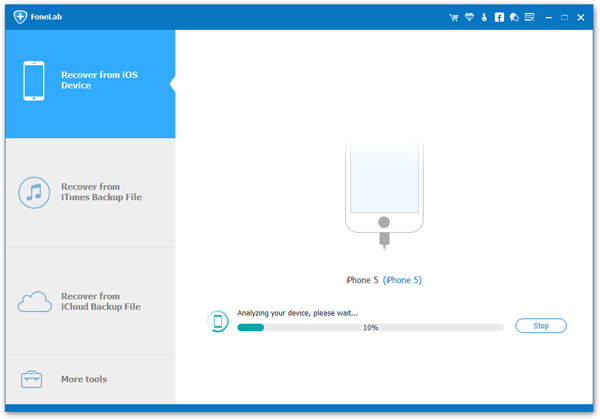 No matter you have a backup or not, iOS Data Recovery has the features to get back lost data. Plus, you can preview the deleted or lost content before recovery. That is the best part of it. Supporting: iPhone X, iPhone 8/8P, iPhone 7/7P, iPhone 6S/6/5S, iPad, iPad Pro, new iPad and iPod Touch. 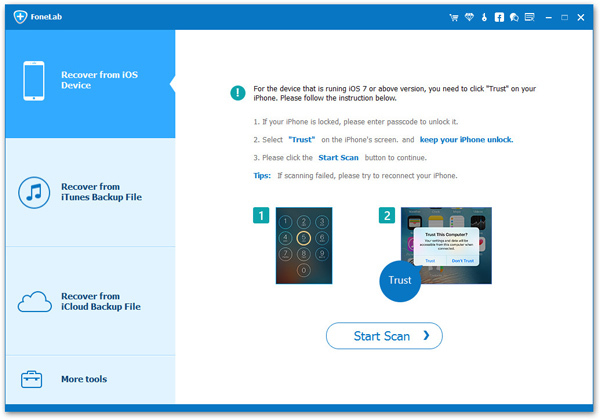 Step 1: Download and install iOS Data Recovery on your PC. Run the program and make sure that your iPhone is connected to your PC. Step 2: Next, select the method on how you want to restore your deleted WhatsApp messages. You can restore directly from your device without backup, recover from iCloud, or restore from iTunes. Step 3: On the left side panel, you will see a few options. If you want to restore deleted WhatsApp messages on iPhone without backup, click Recover from iOS Device. If you're going to recover it from iCloud or iTunes backup, then press the corresponding options. Tips: If you choose to restore WhatsApp messages from iTunes, you will need to select the backup file from where you will download the data. If you want to restore using iCloud, you will need to sign in using your iCloud account. After a successful login, select the backup file from where you will download the data. A window will pop up. Click on the kind of data you want to recover and press "Next." Step 4: Press "Start Scan" and wait for it to finish. After scanning, select on the left side checkbox which type of data you want to restore. In this case, check WhatsApp. You can also choose WhatsApp Attachments to restore attached files of deleted messages. Step 5: Click WhatsApp on the left side checkbox, and a list of deleted messages will show up. Check all the deleted messages you want to restore. Step 6: Finally, press Recover button on the lower right side. Confirm when prompted to download the files on your desktop. Select the location where you want the data to be saved. The files will be downloaded as an HTML file. You should now be able to successfully recover deleted WhatsApp messages on iPhone and save them to your computer. We may accidentally end up deleting messages sometimes. Regularly making backups is still recommended to avoid loss of necessary files and messages. But don't worry. You can use WhatsApp iCloud Backup or iPhone Data Recovery to retrieve deleted messages or chat history on any iPhone.